In annual speed test, international teams must negotiate the complexities of aerodynamics and airflow. This photo may only be republished in conjunction with this Inside Science story. (Inside Science) -- They look like futuristic space pods zooming down the desert road State Route 305 outside of Battle Mountain in Northern Nevada. They’re actually sophisticated bicycles, designed by teams of engineers, athletes, and aficionados to compete for world records for “human-powered vehicles” on land. At this year’s World Human-Powered Speed Challenge, taking place this week, more than a dozen groups from Torino, Toronto, Liverpool, Delft and elsewhere around the world are participating. No one knows who will win the women’s and men’s races or what kind of design would perform best for reducing air resistance and drag. The bikes come in a variety of shapes and sizes, but all will go faster than any traditional bicycle racing along flat ground. Spectators can expect the best teams to approach 90 mph -- faster even than daring Tour de France riders reach during mountain descents. “It’s Burning Man for bike geeks,” said Jun Nogami, a materials scientist at the University of Toronto and faculty advisor for their team. As each year's competition approaches, participants retool their bikes or build new ones, incorporating technological advancements and trying out new ideas. Rather than adopting the upright posture of a traditional racing bicycle, all the bikes are recumbents to keep the rider low to the ground and improve aerodynamics. 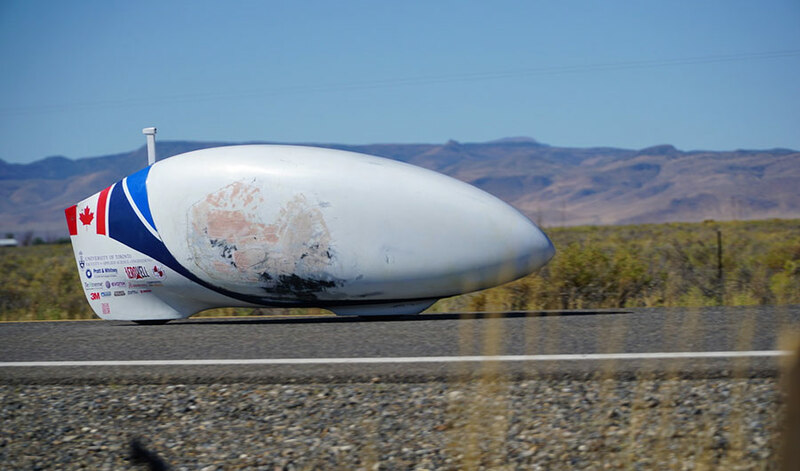 Engineers build an external structure called the fairing to encapsulate the bike and rider, creating a sleek, rounded vehicle resembling a fully enclosed bobsled. Almost no one even uses a windshield anymore, with a camera peering out from the fairing to give the rider a view of the outside world zipping by -- albeit with no depth perception. The riders travel an 8 kilometer track (5.0 miles), but need to maintain power for the testing area, the last 200 meters of the route, where they measure the riders’ speeds. Bikes must not only be enclosed to reduce air resistance, but also be light and able to accelerate quickly. Ventilation also poses a problem, since airflow is required to bring new oxygen into the fairing for the rider to breathe while powering the bike and to flush out carbon dioxide to avoid any build-up inside. The designers and engineers believe there's room to improve. “We’re at the bleeding edge of what’s possible,” Nogami said. The little differences matter. While a few bike shells in previous years had been designed by a sculptor, they now use computers and the principles of fluid dynamics to help determine the best aerodynamics. The goal is to produce “laminar flow,” which requires smooth surfaces everywhere for air to glide by efficiently. For example, Todd Reichert, the current men’s record-holder, noticed in an earlier competition that a tiny insect stuck on the front of the fairing had disrupted the flow along the length of the bike, which likely reduced his speed by a few percent. “It’s more a competition against their record rather than against each other,” said Paolo Baldissera, a mechanical engineer at the Polytechnic University of Torino in Italy and advisor for his institution’s student participants. This year, Baldissera's team has a new bike with a new transmission system and a revamped internal structure. He and a colleague just published new findings in the journal Sports Engineering, where they used computer models to study the airflow within the vehicle. This portion of the airflow can have a huge effect, as some air passes through, not around the fairing. They find that wheel covers produce the biggest savings in air drag power, and the position of an air vent in the back affects the amount of air resistance, too. With all these improvements, they aim to overtake their previous high speed of 79 mph as well as the European record of 83 mph. Many teams are focused on the women’s competition this year and aspire to beat the record of nearly 76 mph. That’s held by Barbara Buatois, a French cyclist who has returned to compete this year. “The women’s world record has been standing since 2010, and we’re saying it’s time to break it again,” said Emiel de Boer of the Delft/Amsterdam team, which has two women competing. One world record was already broken when para-athlete John Mumme reached 28.9 mph using only arm power, on September 12. For the athletes, students, and engineers involved it’s an exciting (and stressful) learning experience.